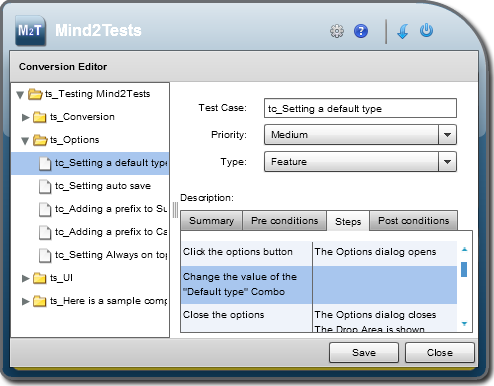 Mind2Tests allows you edit the conversion result before you save it to file. You can edit item names, description, some properties as priority, type. All your modifications are saved automatically. So the "Save" button doesn’t save the modifications, it just opens the Export form. If you edit a step description, the "Next" or "Previous" button will lead you to the next or previous step description within the test case, not the expected results of the current step. To edit the expected result of the currently edited step, go back to the grid and double click the adequat column. If you edit a step expected result, the "Next" or "Previous" button will lead you to the next or previous step expected result within the test case, not the step description of the current step. 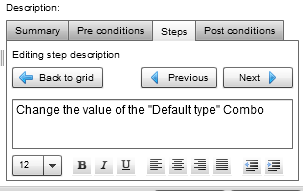 To edit the step description of the currently edited step, go back to the grid and double click the adequat column.